Aircraft Maintenance students at the BCIT Aerospace Technology Campus in Richmond, BC. Today, BCIT celebrated the official opening of the Three Gorges Polytechnic University (TGPU) Banan campus in Chongqing, China. Although students move into the state-of-the-art facility this year, the TFPU will welcome hundreds of students in Fall 2017 to learn from BCIT-developed aviation and automotive curriculum. The curriculum is equivalent to what a student would learn at a BCIT campus in BC, but has been specifically tailored to meet the needs of the growing aviation and automotive industries in China. BCIT has also been asked to deliver comprehensive teacher training to the Chinese instructors who will be teaching these rigorous courses. 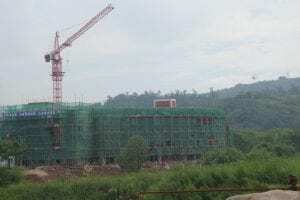 Three Gorges Polytechnic University under construction in June 2016. Chongqing, China. The TGPU partnership is the latest of over 20 successful international partnerships BCIT has cultivated around the world — including at public and private post-secondary institutes in Brazil, Chile, India, South Korea, and Vietnam. BCIT chooses its post-secondary partners carefully to ensure the same high-caliber, practical applied education is being delivered to all students, no matter where they live or study. For further information please contact Jocelyne Leszczynski, Media Relations Coordinator, BCIT.